With the SAP Business One Sales app, you can work with activities, view business content, manage customer data, monitor sales opportunities, and much more. Customers – Access and manage customer information including addresses, phone numbers, and contact details; view historical activities; create new customers and new activities; and contact or locate partners. 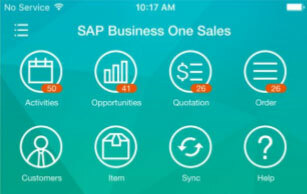 Firstly tap the SAP Business One Sales app and once you have logged in the home screen will appear. You can view the recent activities for today’s date and the activities for the following 4 days. You can see each activity’s priority based on the colour you configure for it, for example Red top priority, Green Normal and orange low priority. By tapping the “Sync” icon it can synchronize the activities in the SAP Business One Sales app to your phone calendar. The Sync calendar function allows you to synchronize your activity from today to one 15 days prior or later. 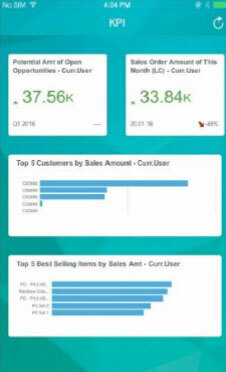 When you tap any of the buttons in the KPI screen, you find that a detailed report is displayed with further information. So now you can manage all your sales opportunities from your iPhone or iPad wherever you are and at a times that suits you! Silver Touch Technologies is a SAP Business One partner that is certified and authorised to sell, install, and implement SAP Business One.